With our first baby due in just 2 days (written 9/15), I have done a lot of research on all different types of baby products. I like to have nice things but also am very frugal. We have done a lot to save on different baby products which I am excited to share with you. We decided to go the disposable diaper route with our baby and I have done lots of research to find the best deals on diapers. With as many diapers as babies go through, I wanted to be able to save as much money as possible on them. -Shop garage sales- I have had a blast shopping at garage sales for our baby. I have gotten adorable clothes from $0.25-$2 each. I have found really nice dresses, shoes, pajamas and more at sales. The key is to know your prices- some items are barely marked down in price for being quite used. Feel free to bargain with the seller as well. I have bought a bathtub from a garage sale, new in package pacifiers, maternity clothing and more. I have found incredible deals. Since babies grow out of their clothing so fast, many of these items are in like-new condition. -Visit Mom-to-Mom sales- In my area, I have visited two great mom-to-mom sales. There, I purchased like new blankets and baby towels for just $1 each! my tip is to get there early because items sell out fast. They have all kinds of items at these sales but they can get very crowded too. Bring cash and have reusable bags to store the items you buy. -Borrow from friends/family- We did not luck out that well in this department because we are the first people in our generation to be having kids. This will be the first grandbaby on both sides so we didn't get a lot of items from family. Our neighbors and friends across the street kindly gave us their baby swing to borrow since their baby does not like it. We are very grateful for this! -Use coupons- I got some awesome deals on items like diaper cream, diapers, wipes, baby lotion, baby wash, etc. by clipping coupons. If there is a sale on different items, check to see if you can find a coupon that goes along with it. -Skip unnecessary items- At this time, I cannot completely tell you which items are unnecessary for baby but I have heard that you really do not need a wipe warmer and tons of clothes. To find out which baby items you really need, ask mom friends and read reviews and articles online. -Shop swap groups/Craigslist- I have found success by finding an $8 Baby Bjorn carrier and a $10 activity mat on Craigslist and a couple of baby items such as clothing on a Facebook swap group that I am part of. It is also nice because you can post what you are looking for and other moms can comment if they have that item available for you. I recently learned about the Walmart brand of diapers called Parent's Choice. This brand has increased absorbency that is equal or better than other national brands. They can help keep your baby dry for up to 12 hours overnight. They have accordion-stretch fasteners to hug your baby snugly. They have a wetness indicator on sizes newborn, 1, 2 and 3 that turns from yellow to blue when wet so you know when your baby needs a change of diaper. They have a new design that is 20% more absorbent than before. Also, on the newborn size, they have an umbilical cord cutout which is really nice to help prevent rubbing and infection. These are available in up to size 6. At this time, I have not been able to compare them to other brands but I like that they cost less money. By using this brand of diapers, you can save $240 per year compared to using other brands. With that money you save, you can buy other adorable clothes for baby! 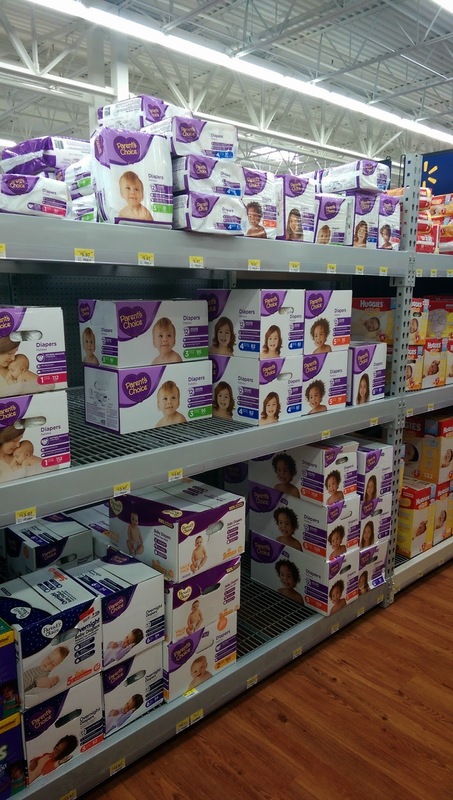 Not all Walmarts have these new and improved Parent's Choice diapers so check out this list of Walmart stores that have the diapers if you are interested. Also, they are giving a good coupon out right now to save $1.50 on a package of Parent's Choice diapers that you can print now. My little boy had 3 showers thrown for him that I haven't had to buy any clothes at 3 months. My mom got a huge bag of boy's clothes at a garage sale for $4 and its just as cute as the brand new stuff.